The station and side platform area was prepared for the long main station building to be permanently fixed to the module. This is right at the front of the module closest to the public viewing side. The side platform was built up using layers of foamcore board to achieve the correct platform height. At the front of the module the curved access road sweeps around in front of the main central part of the station building. For the lower level of the street we left off the topmost 5mm thick layer of foamcore board in this area. The actual street kerbline is made from sandstone and to represent the individual sandstone blocks we used long lengths of strip styrene that we scribed at irregular intervals. This will later be painted varied hues of grey to dirty yellow. The surface of the road was overlaid with flat styrene sheet. This will later have the gaps filled and sanded and be finished to represent the bitumen road surface (we have not yet worked out what method we are going to use to achieve this, having used a variety of different methods on our previous layouts). The surface of the platform is concrete so we gave this two coats of paint in our purpose mixed concrete colour, then when this was dry we permanently fixed the long main station building in place with water-based contact cement. The building was weighed down while the glue went off to ensure good contact. The main station building fixed onto the module with the previously constructed island station building in the background. 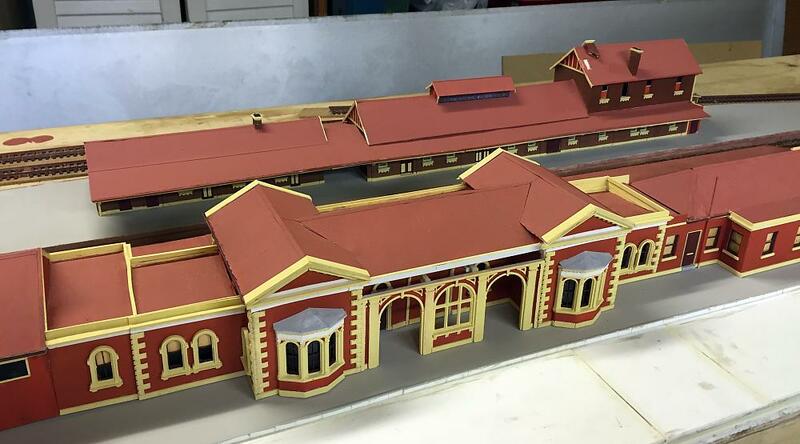 The station buildings were now largely complete with the exception of some additional detailing items, so for a change of pace we decided to look at some of the other structures required for the layout. We had previously purchased a couple of Kibri footbridge kits to use as the basis for the two footbridges that were needed at the station. 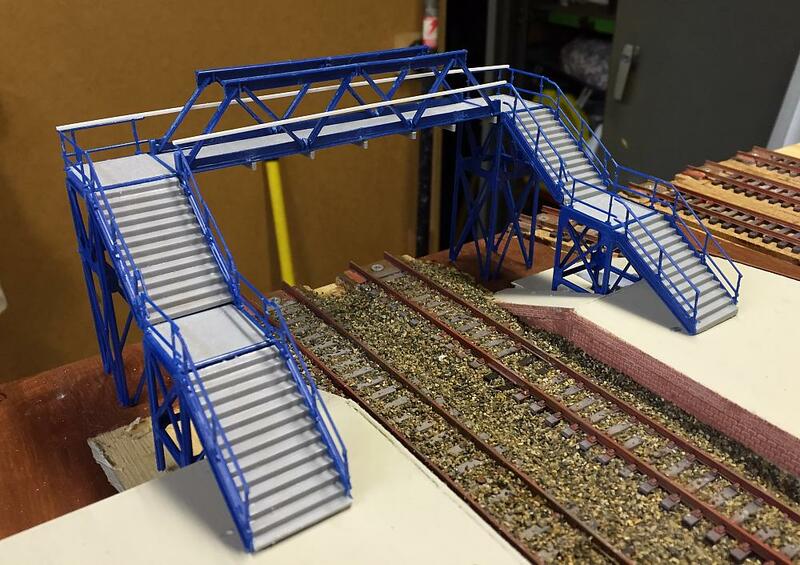 We have used the Kibri footbridge kits on our previous layouts and find them very easy to work with and, with a little modification, most suitable to represent typical NSW footbridges. Referencing the drawings we had obtained and the photos that we had taken on site, we decided to tackle the northern footbridge. It is the smaller of the two footbridges so we thought it would be the simplest to build. It only provides for pedestrian access between the side platform and the island platform. The footbridge at the north end of the station temporarily placed where it will eventually be permanently located on the module. Building one of the kits as is would make the footbridge both too high and too long. Firstly we trimmed the elevated walkway parts to the required length we needed. Luckily this was as simple as trimming it back by removing just one of the triangular truss frames. That left us with the perfect length to span across the two main lines. Next we trimmed down each of the flights of stairs to achieve the overall height we needed. Then it was a matter of tackling each of the supporting trestles in turn, trimming them to length as required to match the clearances we now had between the underside of the walkway and the two landings and the ply surface of the module. Parts of the ramped platform ends were cut away as required to make room for the trestle legs to sit flat and even on the ply module top. Some additional styrene strip was added to the footbridge as required for strength and also to represent items noted on the prototype footbridge. After a test fit to make sure the completed footbridge would fit okay (and a quick pic for this update) the model footbridge was put aside for final detailing and painting at a later date. The main part of the goods shed carcass constructed from foamcore board. The corrugated roofing is not fixed but has only been loosely placed on top. On the other front module by far the most dominant structure is the goods shed. This is a very large building of brick construction with a corrugated iron roof plus additional awnings and smaller add-on structures. For the carcass of the main part of the goods shed we used 5mm thick foamcore board. This is light but strong and we were able to quickly cut out and glue together the four walls and two pieces forming the pitched roof. A few openings were left in the front wall and the two end walls, one where the door would actually be left open, and the others where there would be doors installed, recessed behind the brick facades. Next month we will be able to continue work on the goods shed by cladding it in brick embossed styrene sheet.